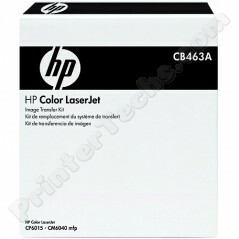 CB463A Transfer kit for HP Color LaserJet CM6030 MFP CM6040 MFP CP6015 series . This is a brand new, genuine HP part. Alternate part#'s CB643A , RM1-3307 , RM1-3307-040 , RM1-3307-000 , Q3931-67908. Stock is limited -- please call for pricing and availability 866-352-7108.